Let’s talk British baby names American parents should steal. It’s not that we lack these names in the good ol’ U-S-of-A. But families across the pond smartly chose these names in much bigger numbers. How big? Enough to put them in the new Top 100 Most Popular Names in England & Wales. Since we speak the same language and share many of the same pop culture favorites, from the Beatles to Game of Thrones, you might expect significant overlap in the two popularity lists. And many names do repeat. We’re all wild about Olivia and Noah, Mia and James. But today we’re focusing on the names that are far more popular in the UK – at least, for now. The British love nickname names for boys, and Archie has been in their Top 50 for over a dozen years. 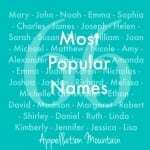 Originally short for Archibald, in the US it brings to mind a different name – surname Archer, currently at #262 in the US. If you love friendly Charlie, but want something less popular, Archie fits the bill. Amy Poehler and Will Arnett welcomed son Archie in 2008. Dexter sounds like a Felix/Carter hybrid, part preppy surname name, and part quirky retro revival. But Dex feels every bit as cool as Jax, and the name’s been worn by some great characters, like Cary Grant’s dashing leading man in The Philadelphia Story. One downside: the murderous main character of long-running television series Dexter. Perhaps a longer history of use in England makes the fictional character less of a factor. Parents sometimes lament the popularity of classic boy names like Henry and William while overlooking so many other possibilities. Over in England, parents have continued to use Edward in significant numbers. It’s a good reminder that the name wears well today, with nicknames like Eddie and Ned fitting right in with Charlie and Max. A generation of younger parents probably thinks first of Twilight – but since that series didn’t hurt Bella, Jacob, Jasper, or Esme, why wouldn’t Edward feel every bit as current? File Freddie with Archie and so many other nickname names British parents write directly on the birth certificate. American parents put Frederick at #514, well behind traditional choices like Charles and James. Maybe Fred is still too Flinstone ’round here, but Freddie Mercury makes this rock ‘n’ roll and actor Freddie Highmore updates it for a new generation. Other short forms include Fritz, Fitz, Rick, and Red. Love Leo, but already know two? Hugo could make the perfect substitute. It feels cuddlier than Hugh, but every bit as traditional, with a great meaning – spirit. Hugo Boss makes it high fashion; Victor Hugo takes it in a literary direction. Here’s a curiosity: Americans prefer Jensen, with an ‘e’. That name charts at #365 in the US. But in England, parents prefer the -son spelling, taking Jenson to #58. It’s a fabulous name to honor a Jennifer, or just an update to so many two-syllable, ends-with-n names for boys. English parents often pronounce Louis like Louie – which ranks #47 on their charts. Americans tend to opt for the Lewis sound, which is #75 in the UK. In other words, all of the Lou- names for boys fare better over there, while we’ve favored Lucas and Luke. Louis would be a fresh classic choice for an American boy, traditional but not often heard. The Gilmore Girls makes many of us hear Rory as potentially feminine; it does appear at #637 on the girls’ charts in the US. But Rory means red king, a name from Irish history. It feels upbeat and Irish, an alternative to the wildly popular Aiden and Liam. Sometimes the English revive a name ahead of American parents. Count Stanley in that category; it’s climbed steadily for two decades there. Over here, the name languishes in style limbo. Comic book legend Stan Lee lends it some cool, and Marlon Brando’s brutish Stanley Kowalski in A Streetcar Named Desire is unforgettable. Plus, it fits with surname name and place name trends nicely. 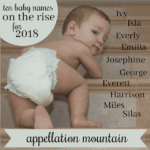 Esme is gaining in the US in recent years, but it’s positively mainstream among British baby names. While it means loved in Old French, the name first appears in sixteenth century Scotland. American author JD Salinger lent it some literary style with his 1950 short story “For Esme – with Love and Squalor,” and Twilight brought it to the attention of a new generation. The short, simple name could wear every bit as well in the US. With a lovely meaning – happiness – and a lacy, romantic sound, Felicity feels like a vintage name right at home in the 21st century. But while this makes the Top 100 of British baby names, Felicity languishes in the mid-300s in the US. Still, that’s the name’s highest ranking. Credit to the late 90s television series, and actors Felicity Huffman and Felicity Jones, as well as an Arrow character by the name. I’ve called Harriet a vintage name ready for revival. Apparently, the English did not need to be told! Harriet, with so much rich nickname potential, makes it to the England & Wales Top 50. American parents like Hattie, at least a little bit – it ranks around the 500 mark. Maybe the difference is all about brother Harry – English parents put the casual form of Henry into their Top Ten, while it’s relatively obscure in the US. With the supermodel style of Heidi Klum and all the enduring charm of the Johanna Spyri novel, Heidi almost counts as a classic. Except American parents embraced it in the 1960s, 70s, and 80s, which puts it in mom-name territory now. As so often happens, English parents are on a different cycle – they’re still wild about Jessica, we’re not quite ready to revisit Heidi. And yet, Heidi is part of a powerful name family – it’s related to Adelaide and the other Addie names. American parents put Charlotte at #7 in our rankings, but Lottie is barely a blip, far outside of the current Top 1000. British baby names get it right, putting this sweet Charlotte nickname in their Top 100. If you love Ellie, but want something less popular, Lottie seems like a potential substitute. Homespun and humble, Martha brings to mind the founding First Lady, as well as domestic goddess Martha Stewart. It’s a buttoned-up name, lady-like and substantial. But so are Charlotte and Elizabeth, Alice and Esther. Martha ought to fit in with so many classic names just fine, and English parents already recognize that fact. Love Sadie, but fear it’s overused? Borrow one from British baby names! Maisie makes their Top 100, but fails to break into the American Top 500. Originally a nickname for Margaret, today Maisie feels like a substitute for many other nickname names, like the fading Molly or the sweet Gracie. It stands on its own nicely. Matilda might seem more quintessentially Australian, thanks to the folk song. But Matilda also makes the Top 25 in England & Wales. Daring namer Roald Dahl gave us an unforgettable Matilda in his 1988 children’s novel. Matilda feels quirky and capable, a name with history aplenty and – at least in the US – still under-the-radar. American parents adore other names with similar sounds, like Emily and Amelia and Molly. But thoroughly modern Millie remains off most parents’ shortlists in the US. That’s changing slowly, but British parents have been keen on Millie for two decades and counting. Count Thea among the white hot girls’ revivals of our moment. Theodore’s jazzy sister got a boost from a popular character on Arrow, and shares sounds with long-time Top Ten name Mia. Thea is rising quickly in England, too, but it’s accelerated much faster, taking Thea into the Top 50. Princess Anne, the eldest daughter of Queen Elizabeth II, named her firstborn daughter Zara back in 1981. It’s not a conventional royal name by any means. (Though in the dystopian novel V is for Vendetta, Queen Zara reigns.) But it’s become a mainstream choice over the years. It’s even been a Top 100 pick for most of the 21st century. With American parents loving Z names like Zoe and Zoey, why not Zara? Yes, if you’re counting, that’s nine for boys and eleven for girls. Now, over to you! Which British baby names should American parents steal? Are there others that you would add to this list? I feel there’s far too many kids named Archie, Freddie, Teddy, Charlie, Alfie, etc. in the UK at the moment. Makes me roll my eyes every time I hear another one. We’ve got a bit obsessed with nickname names, and my personal feeling is they won’t age well. 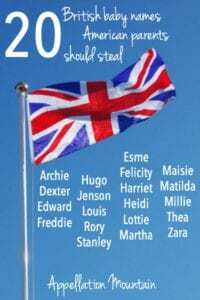 I like Archie, Edward, Hugo, and Stanley for the boys, and Harriet, Maisie, and Matilda for the girls. I briefly considered Maisie and Matilda when I was pregnant 16 years ago, but didn’t pull the trigger on either. With the exception of Hugo I wouldn’t consider any of the boys names listed. But the British list has some I do like – Reuben and Harvey jump out. I like more of the girls – Felicity, Matilda, Zara, and Esme especially, though some of the others are just much too sweet for my taste. But my most favourite popular in Britain and entirely unloved in the US name for girls is Imogen. I adore Imogen. I think Ivy and Iris are also appealing. Oh, and Beatrice. Is it usable? I want it to be.